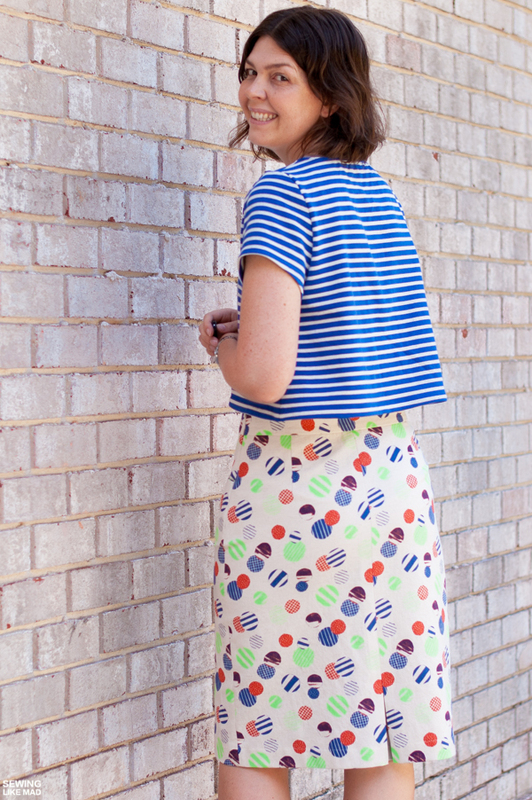 Sewing Like Mad: Inari Tee and Pleated Pencil Skirt. Inari Tee and Pleated Pencil Skirt. I have made a deal with myself to sew more of my favorite patterns in my stash. I think we can all agree that it is very easy to be caught up in the next new pattern and even though we say to ourselves "I'm definitely making ten more of these because I loved the fit/style/whatever so much" it doesn't always happen. Or at least I don't always get around to it - I should only speak for myself, right! But I'm determined to change that. Because when sewing for myself I always take the time to get the fitting right to my body, and I always make the changes to the paper pattern too, so that next time is SO much easier to sew...although a new type of fabric of course can throw things off. 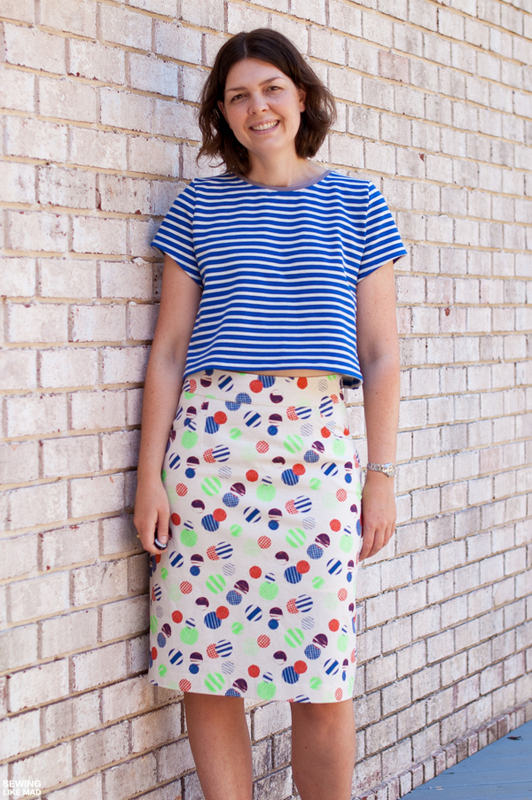 So today I'm showing you two patterns that have proved their worth in my closet. 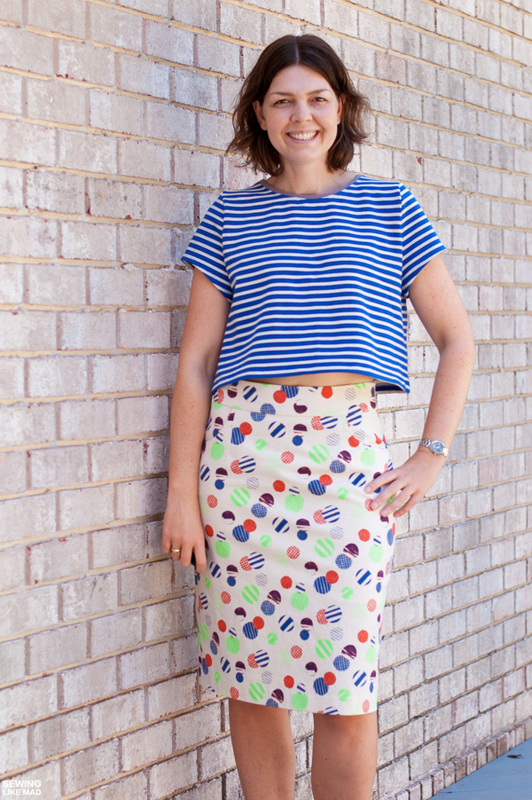 One is the Pleated Pencil Skirt by Delia Creates. First blogged HERE and HERE. 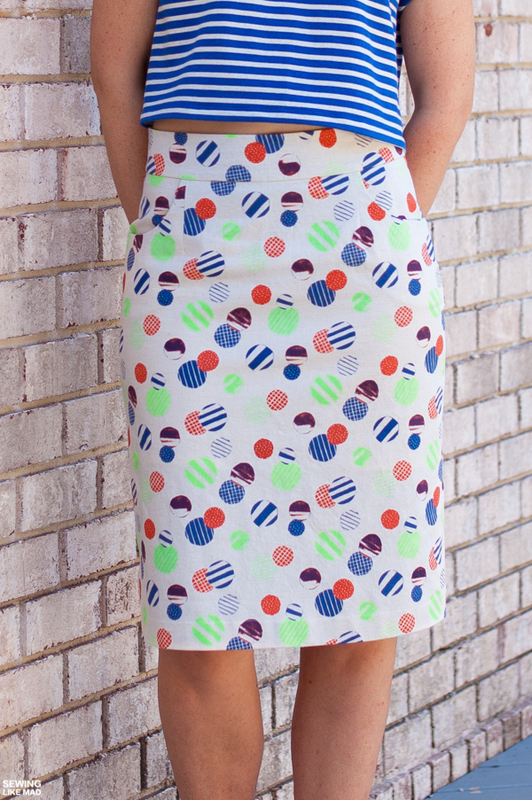 And the second is the Inari Tee Dress by Named Patterns. I have never sewed the (cropped) tee before (the pattern is a 2 in 1 pattern) but I have made two Inari Dresses, both blogged HERE. This outfit started with the skirt fabric. I ordered this mid weight Kokka canvas from Miss Matatabi without a specific goal for it. Basically I was dying for the print and colors. Since it was canvas I considered to make a Senna Tote but when I received it, it was a rather thin canvas. Sure it could still have worked for the Senna Tote but I realized it could also work for a pencil skirt (in fact anything that didn't needed drape). And since I already had a pencil skirt pattern in my stash AND I used those two skirts I already made from the pattern quite a lot (pretty much every time I wanted to look a little bit nice but not too dressed up. Date night with hubby - perfect!). Well, that was a no-brainer really. Pleated Pencil Skirt it was. There is the pleat...hence the name...instead of a slit. Clever! I added the pockets myself, that's a pretty simple operation. THIS old tutorial of mine will show you how. The shape is a bit different but the principle is exactly the same. 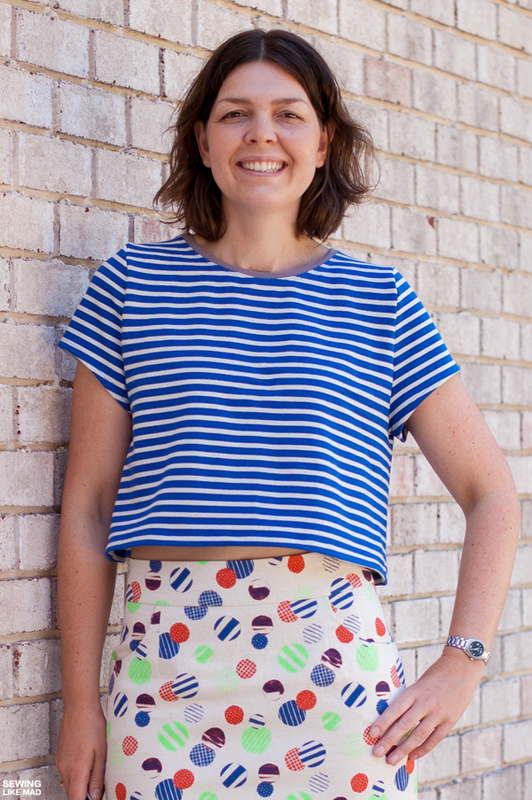 I wish someone could have filmed inside my head when I realized just how amazing this blue and white striped cotton French Terry, already in my stash, matched the print on the skirt fabric. I think there were heart eyes and fireworks going on big time, ha. My eyes went from one fabric to another and back again. Yup, perfect match. Hallelujah! 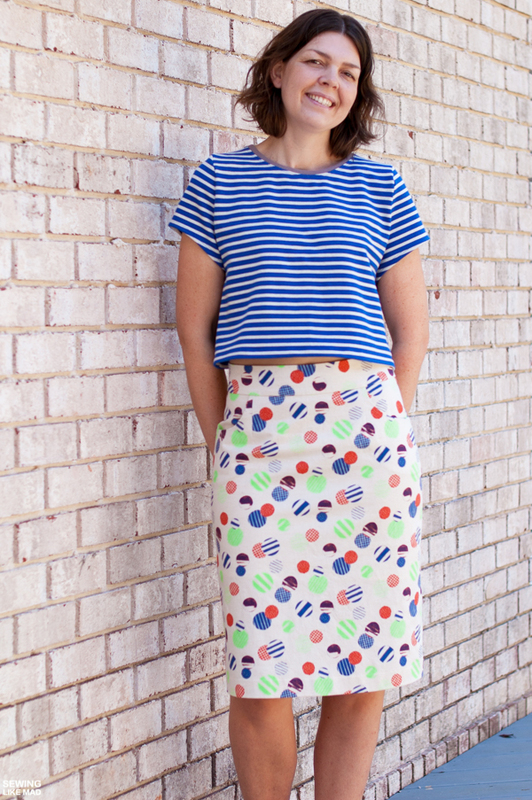 Initially I was planning on making the Halifax Hoodie by Hey June Patterns because well, THAT is certainly a tried and true pattern in my closet and I loved the relaxed style as a contrast to the more stylish style of the skirt. BUT then it turned out I didn't have enough fabric, gah. And I was determined not to color block this time because I didn't wanted to mess up the match with the skirt. And then I remember that I really wanted to make an Inari Tee since I knew the fit was fantastic. And when a person with my body type wear a wide crop top it looks really flattering when you pair it with something tight like jeans or.....a pencil skirt (woohoo) for a balanced look. That lack of fabric was meant to happen, I just know it, ha! So here I am, 39 years old and flashing a bit of midriff. Yeah, I should never say never, haha. It's so funny because I love the look, also on myself, but I still think I'm going to put a tight tank top under the next time I'm wearing it. The reason is a feeling and I can't even explain it. But I think I would feel best like that. Before going out to take these photos I looked in the mirror, and I saw no midriff and then when I saw the photos it was there. Oh well. Like I said earlier, I liked the look on me, so I was not going to retake the photos. Maybe I just need to get over it! (Wo)man up! I'm definitely not over this outfit though. I think another date night is in order! I love this outfit so much! (Haha, I probably say that every time you sew something, but it's TRUE!) The pairing is indeed perfect, and I love that you are working a crop top. It looks terrific. I know what you mean about feeling comfortable. I think a lot of the confidence we feel when wearing something happens because we also feel comfortable in it. Yay for date night outfits! What a stunning outfit - it looks awesome on you and YAY for the fabric matching! You can definitely woman up and flash that (very tiny bit of) midriff, but I understand the need to feel comfortable and confident in what you're wearing, and that's probably the most important thing. It's a great outfit. Wear it as is with pride. You look amazing. Celebrate it! I am not even kidding when I say this may be my favorite thing you have ever showcased!!! 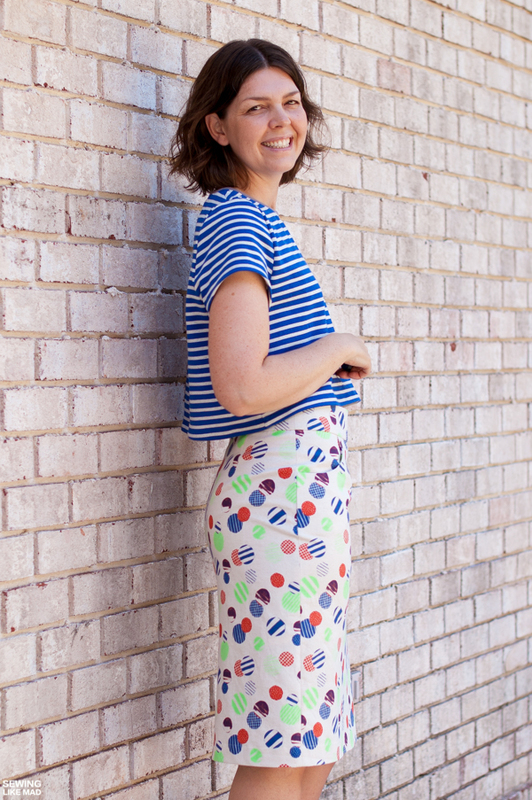 I love the way it looks on you, I love the fun play on patterns and textile matching, and I love the fact that it just looks like you are having FUN in it!! So so in love with everything about this look! You need to may 100 of these outfits!! It looks amazing on you. Really!! You have to feel comfortable, but that barely there midriff looks nice not at all revealing. I say go for it!! I love love that you added pockets! So perfect! You paired this perfectly with the crop too. Indeed, the fabric shortage was meant to be. You're right about the silhouette being super flattering too. And the fabric pairing is a match made in heaven. I agree with Jess...one of my most favorite things you have sewn! So good. Love everything about it. I have a crop top that shows a bit of my midriff if I stand a certain way, and I also feel way more comfy with a tank top underneath.You can totally get away with wearing it this way though! Looks great! I LOVE THIS OUTFIT. 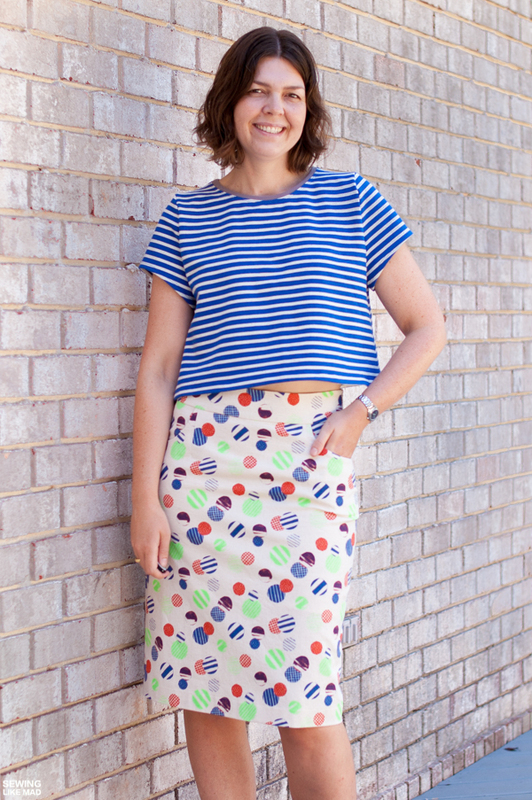 Perfect print combo, and I love the little hint of midriff - it looks great. Gah! I agree, We need to sew the patterns that we love over and over. You are sure of a great result! This looks so good on you and another reason to get that Inari Tee!! Looks perfect from here! Flash away! I love the silhouette these two pieces make ... it's perfect and yeah that's a fabric match made in heaven! woman up! you look gorgeous!